Prominent & Leading Manufacturer from Agra, we offer fancy wedding trays and designer wedding trays. In order to meet the precise requirements of our valued patrons, we are engrossed in providing an exclusive array of Fancy Wedding Trays for our respected customers. The offered range is provided to our prestigious clients after taking into consideration their detailed requirements. In addition to this, we are providing these products after checking them by a number of inspections in order to make sure their quality. 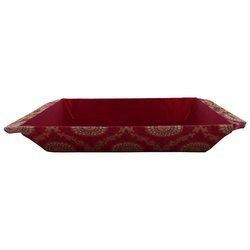 Being one of the top industries of this domain, we are actively engaged in offering a wide assortment of Designer Wedding Trays for our customers. The provided trays are widely used for various purposes like packing sweets, hamper packing, and many others. These products are available with us in various sizes at very affordable prices. Looking for Wedding Trays ?